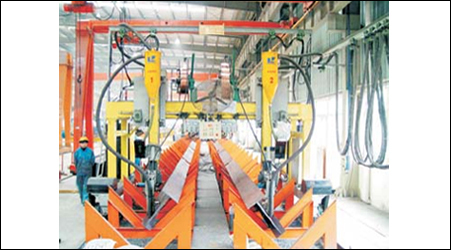 It is highly efficient Oxy/Fuel flame cutting machine. As to the longitudinal multi-head straight cutting, the cutting torch height not only can be adjusted manually, but also controlled unitarily, group by group and one by one accordingly. This machine can used for three different work as Strip Cutting, CNC Profile Cutting with oxy fuel torches & Plasma Cutting (optional). It is designed for metal structure factory, shipbuilding factory, crane factory & etc. Different sizes according to customers requirement can be designed. 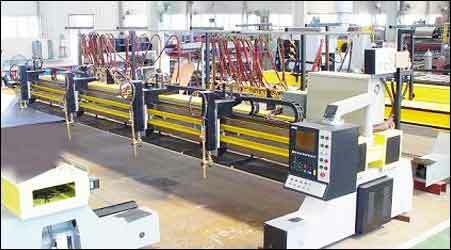 This machine can weld two parallel welding seam of one workpiece at one time. 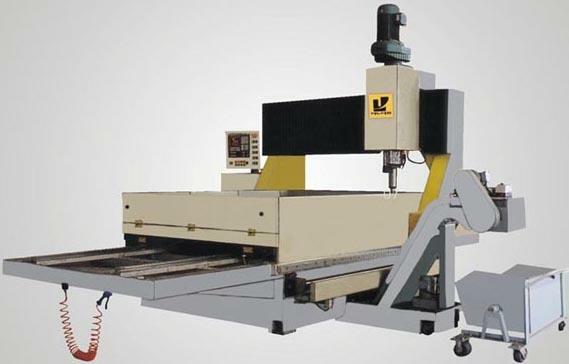 Charactered with single arc and double wire angle welding function, this model machine is applicable to light beam steel volume-production and variable cross section of beam steel welding, which is t-riumphantly applied to longitudinal girder polyline assembling welding of semitrailer. 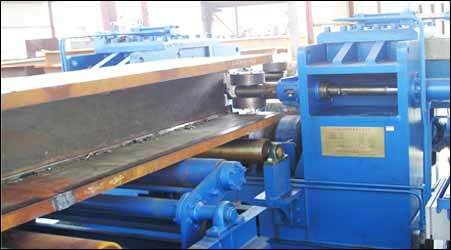 1 Web plate height : 200-2000mm The machine is Applicable to symmetric and asymmetric ,variable section H beam assembling and welding . This machine adopts double arc and double wire submerged welding with high production quality. 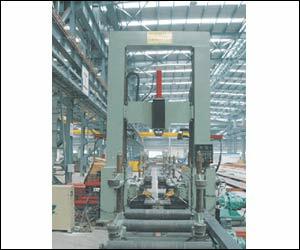 Machine is equipped with two groups of floating lead arc devices to get the welding wire in good position to welding seam. There are two groups of flux feeding devices and two groups of flux recycling devices. Host vertical driving system adopts double driving, which be driven by frequency conversion motor so as to moves stable. It is divide into to floors,  up floor is a place for welding wire and the down floor is a place for welding machine. Welding cantilever is at two sides applicable to heavy H beam steel welding. Driving device :double side AC frequency conversion driving. Double driving, composed of AC motor and gear box. There are two sets of trolleys on the face of gantry frame, the trolley can move left and right by reducer, gear and rack driving. Welding head can be moved up and down, seam tracing device is equipped on the lead beeline bearing. Host is composed of platform, fixing frame at two sides, two moving welding cantilever , lead arc frame and etc. There is a ladder for worker to go up and down. This machine is a multiple functional blast clearing equipment for steel structure and all kinds of profiled bar and steels. Using this machine can not only clear the rust?slag?but also can eliminate welding stress, reduce distortion, improve the anti-fatigue function of workpiece, strengthen the adherence of paint membrane. 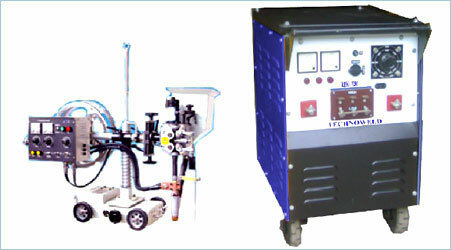 This machine is a high function shot-blasting machine which transmits flatly, in the process of clearing the adjustable motor will take the flat engine into the blasting area, then the shot from all directions will hit the workpiece densely and heavily, this makes the oxidation skin and rust fall off rapidly, also prevent distortion of workpiece. This machine is the best equipment for the metal welding?steel products?rail car?project machine and bridge building industry to clear away rust.